As another new year rolls around, maybe you’re looking to upgrade your furniture. How about if you want a sofa that will help you if you’re suffering from back pain? While manufacturers don’t seem to market sofas specifically for this common problem, we dug deep and tested a wide cross-section of models to unearth 12 that offer all the support and space you need if you have a bad back. We’ll launch straight in with some frank, honest reviews then we’ll give you a few simple pointers on posture. After all, the way you sit is just as important as what you sit on. Get the best of both worlds today and minimize the chance of future back pain developing. On one level, you get a comfortable and luxurious sofa with individual seating components. Measuring up at 86 x 43 x 42 inches when upright, there’s more than enough space for 3. If you’re snuggling up for a movie with your husband, though, you can pull down the central armrest and it converts into a handy table for your drinks and snacks. Power recline allows you to tweak the seats and headrests at the push of a button. However you prefer positioning yourself to support your back, Seatcraft makes it easy for you. Convenience is uppermost with this sofa. From the wireless charging station to the lighting at the base, the hidden in-arm storage to the lighted cupholders, those little details stack up into a wonderful all-round seating solution. Choose from black, brown or red leather which looks and feels great. It’s also rugged enough to give you years of faithful service while enabling perfect posture to support your back throughout the longest movie marathon. What do you do if you want a sofa supportive enough to prevent or manage back pain but you don’t want to compromise comfort? Well, this reclining loveseat from Homelegance plugs that gap nicely. 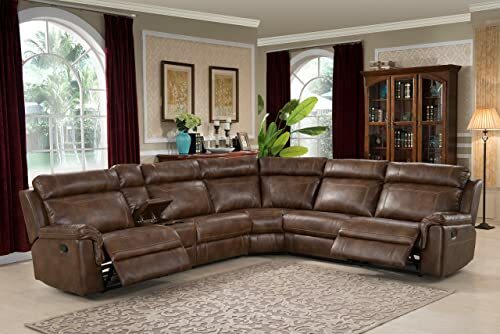 Made from bonded leather, you’ll get the optimum combination of a sofa that feels soft and snug while still offering ample support and durability. The recline mechanism is manual and controlled by a simple lever. You’ll enjoy a gentle gliding motion when the seat is not raked back. The leather look is broken up with some studded nails down the arms for a wonderful dose of contrast without spoiling the subtle look. Choose from black or a rich, deep brown and treat yourself and your back to something special without spending a fortune. 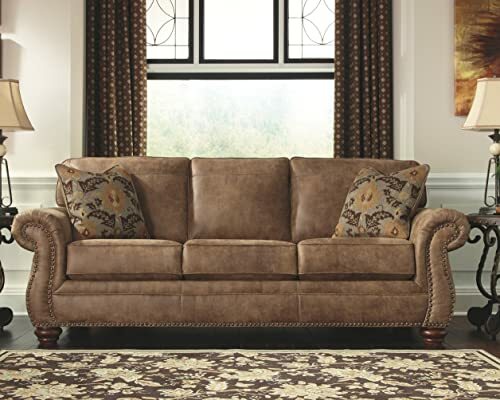 The seating is bonded leather while you’ll get the added ruggedness of vinyl and faux-leather throughout the body. As an inbuilt bonus, there’s a cup holder and storage compartment baked into the console. Divano Roma has a solid reputation for producing durable yet visually appealing furniture at a reasonable price-point. Finished in a luxurious fabric that’s soft to the touch, the stuffing conspires to give you a great deal of support for your back and spine. Since the seating is generously sized, you’ll have ample space to wiggle around while you’ll also be able to recline fully. The middle seat won’t recline, though. The only real niggle with this sofa is the minimal assembly required so if you’re looking for something to roll straight out the box, this is not for you. If, on the other hand, you want to look after your back along with your bank balance and comfort levels, give it a try! If you’ve got a slightly more fluid budget and you appreciate the finer things in life, this 6-piece sectional from Christies does more than just look great. For anyone suffering from back issues, reclining offers one great way to take the load off. Of these 5 seats, 3 recline. Further support for your back is served off thanks to the pocketed coils encased within the foam innards. You should note that this sofa is not made from genuine leather. The listing does not make this clear. That said, the polyester has the look and feel of leather while offering outstanding durability into the bargain. Hardwood reinforcing and a rugged steel rail system mean you’ll get furniture built to last even if you need to spend a little to achieve that. As you’d expect from this kind of sectional sofa, you’ll get integrated storage so you can keep your drinks nearby without needing an extra table or worrying about knocking them over. If you want to give your back all the support it needs and improve your posture while also benefiting from a commanding and comfortable sofa, this sectional hits the spot. 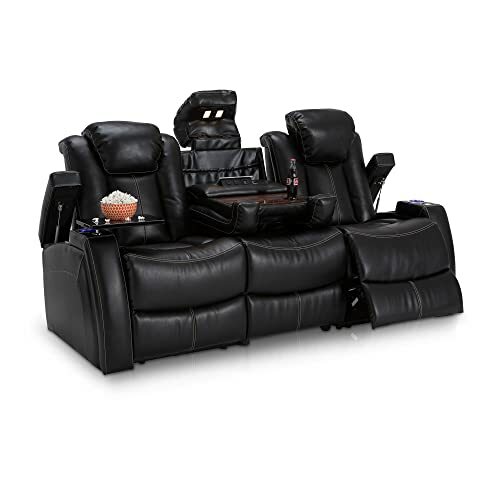 To round out, we’ve got another take on the reclining sofa for your home theater which also serves to promote superior back posture. 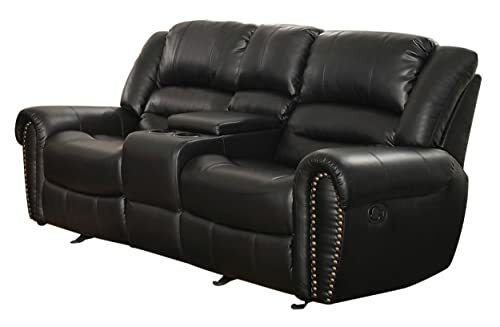 The design of this recliner makes a real statement finished in mean black leather gel. There’s a brown version available too if you’re not sold on black. The reclining control panel lets you rake back the seats for optimum back support at the push of a button. The headrests are also fully adjustable, ideal if you’re suffering from any neck pain or shoulder strain. 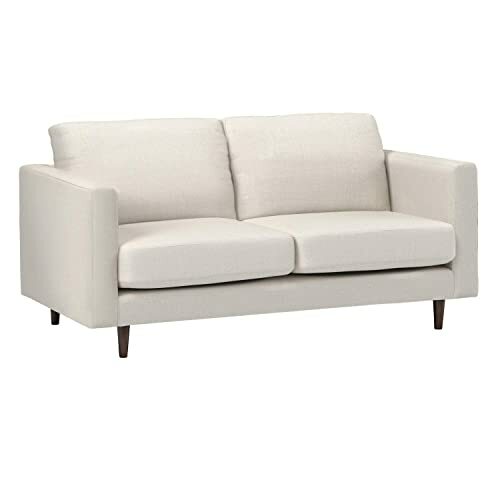 This sofa is built to support your body in all the ways that count without sacrificing design or functionality. QI-enabled device slip neatly onto the wireless charging mechanism which is a neat and valuable touch. Storage is robust with a fold-down table, tray tables and storage integrated into the arms and even some cupholders with ambient lighting so you won’t spill your drink when the lights are dimmed for your movie. This is one of those rare reclining sofas that manage to cover all bases. It’s relatively affordable, large enough to seat the whole family, comfortable while also delivering plenty of back support and comes from a brand you can rely on. What’s not to love? If you’re looking for additional lumbar support, the Seatcraft Lombardo and Vienna boast this feature so for anyone with serious back problems, it’s worth investigating these other models, too. If you’ve got a more trad-styled living room and you’re looking for a touch of understated luxe, this Larkinghurst sofa from Ashley Furniture is just the ticket. Whether you’ve got back pain you want to keep at bay or you’re just concerned with proper posture and you want to prevent aches and pains from developing, the upright and nicely padded back of this sofa gives you ample support without an unnecessarily harsh sitting position. 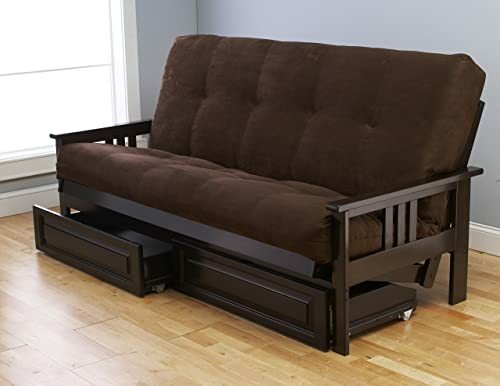 If you hate the idea of an Ikea-style assembly job, you’ll be able to cart this sofa directly into the lounge and it will fit neatly through doors up to 32 inches wide. It measures up at 89 x 39 x 38 so, once installed, you’ll have enough room for you and the kids. 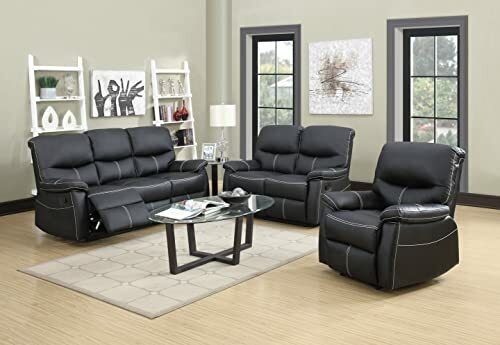 The polyester/polyurethane blend of the sofa and the pair of cushions provided are combined with faux leather so you’ll get seating that looks great but is built to stay the distance and is remarkably easy to clean too. What’s not to love? Whether you’ve got back pain to consider or you just want a striking addition to your living room furniture, the Larkinghurst hits the spot. It’s not particularly cheap but the best things in life come at a price. If you’re conscious of getting a sofa tailored to help soothe or even prevent back pain, a recliner is always a strong choice. With this BestMassage set, you’ll get the choice of multiple positions while the back also gives a caressing and supportive feel. One thing to clear up is that this is not a massage chair. The listing doesn’t make this claim but you might fall for the brand name and assume, incorrectly, you’ll be getting a massage! 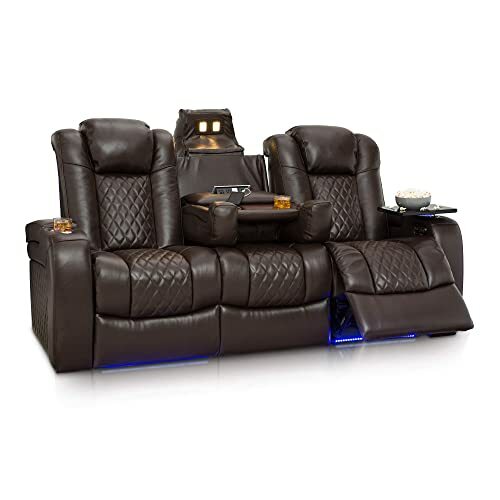 Hit the reclining switch, though, and you can go back into a near-horizontal position when it’s time to relax or remain far more upright all without eating up as much space as many recliners require. The manufacturer claims you can place this sofa as little as 2 inches from the wall and still recline. We’d suggest you need to be a little further away than that but it’s still a praiseworthy, space-saving design. 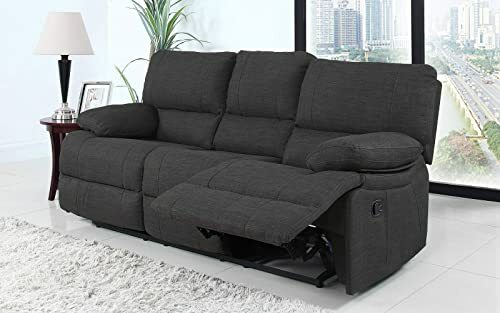 Along with the 3-seater sofa, you’ll get a single and double chair so, considering the reasonable price-point, you’re getting a great bargain with comfort and support uppermost. A solid wooden frame, high density foam and a PU finish gives you a solid set of furniture that should yield years of faithful service. Just wipe down to clean, perfect if you’ve got a house full of messy kids. Classic looks mean this sectional sofa from Carolina will slip easily into a more traditional living room while it also has a modern aesthetic suitable for more minimalist décor. Varying your position when you have back pain is key and this sectional – especially if you also opt for the ottoman – lets you move around, all the while in complete comfort. Whether you want to lie full stretch or perch stacksitting in a more upright position near the edge of the couch – you’ll get all the versatility you need. Finished in a pale gray with dark brown legs for contrast, this sofa is a looker as well as delivering supportive and comforting seating. You’ll get armed and armless chairs giving you a great deal of scope if you want to rejig the seating arrangement. Whether you’ve got guests over or you just fancy a change of layout in the living room, you’ll have multiple options at your fingertips in one easy-to-assemble package. Many sofa beds work well until it’s time for bed when you end up with a sub-par mattress and a poor night’s sleep. Jerry Sales has ensured you don’t fall foul of that with a padded and supportive 8-inch innerspring mattress available in queen-size or king-size that will wow your guests with a luxe futon so comfy they’ll want to stay an extra night. That comfort and support also helps anyone suffering from back pain when the sofa is in its daytime role. The angle of the cushions at front and back helps you to ruck yourself into a position where you’ll get no unwanted strain on your back. 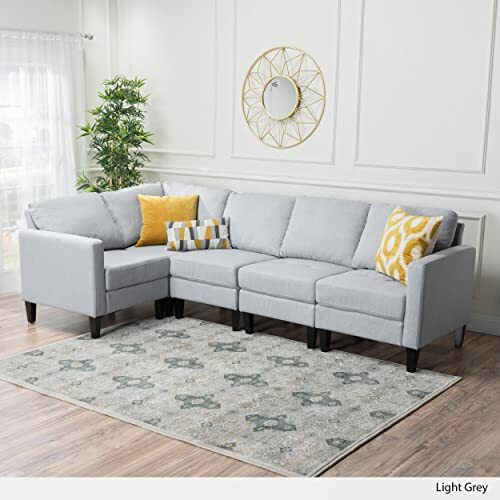 An impressive selection of color schemes and the option of adding storage drawers makes this a space-saving and robust sofa perfect for sufferers of back pain and also the rest of the family and overnight guests. If you’re looking for an uncluttered and classic sofa with a modern twist on classic looks, Rivet’s Sloane comes in two sizes (65-inch and 81-inch) so you can uprate your seating whether you’ve got a sprawling lounge or a smaller studio to furnish. If you’re investing in a sofa, you obviously need to consider durability, especially if you have children or pets. The Dacron-wrapped foam of the cushions makes wiping this couch down a cakewalk. The frame is covered with a resilient polyester that looks great but is rugged enough to withstand some heavy punishment. When you need to thoroughly clean your sofa, you can easily remove the seats and cushions to streamline this. With a medium depth, lean, seat height and cushion sit, don’t make the mistake of thinking medium translates to average. If you’ve got back pain, this happy middle ground gives you a relaxed but supportive position along with a sofa that looks great into the bargain. If you’re wondering what a transitional sofa is, it simply refers to design that could be described like the clothes of Paul Smith: classic with a twist. You’ll get the benefits of tradition married to the advantages brought about by modern technology. 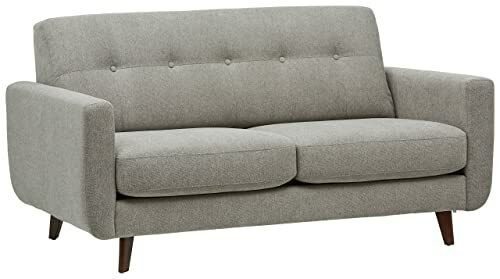 This Stone & Beam sofa – they’re an Amazon brand – has high and deep seating along with fairly firm cushions so, depending on your type of back pain, you might find this among the most supportive options on the market without experiencing any discomfort. The seat lean is pitched roughly in the middle so you can sit pretty upright while still feeling nicely relaxed. Hardwoods and laminates work well together and the blended fabric cover is easy on the eye but remarkably hard-wearing and also easy to clean. Whether or not you’re niggled by back pain, the Stone & Beam transitional sofa makes a wonderful addition to any living room with the chameleon-like design allowing it to slot in neatly anywhere without dominating. Space is often too tight to mention and multipurpose furniture remains a popular choice for apartment-dwellers the world over. While the Rivet Revolve doesn’t offer quite the same comfort when it comes to sleeping as you’ll get with the Jerry Sales model above, in terms of seating, it’s arguably better. Rivet is another Amazon brand and in their handy Comfort Overview, the Revolve hits the mid-point across the board. From height and depth to cushion sit and seat lean, you’ll get a sofa just about perfect for soothing back pain and warding off any future problems before they take effect. With our reviews put to bed, we’ll round out with some simple pointers on preventing back pain from blighting you in the first place. As you can see, there’s plenty you can do if you suffer from back pain or you’re concerned about aches and twinges developing into a more serious and ongoing problem. In terms of the sofa you choose, make sure there’s ample room to recline fully if you want to spend some time laterally. Opt for something that’s at least mid-firm rather than being suckered into going for a soft couch that will end up causing more problems than it solves if you’ve got issues with your back. 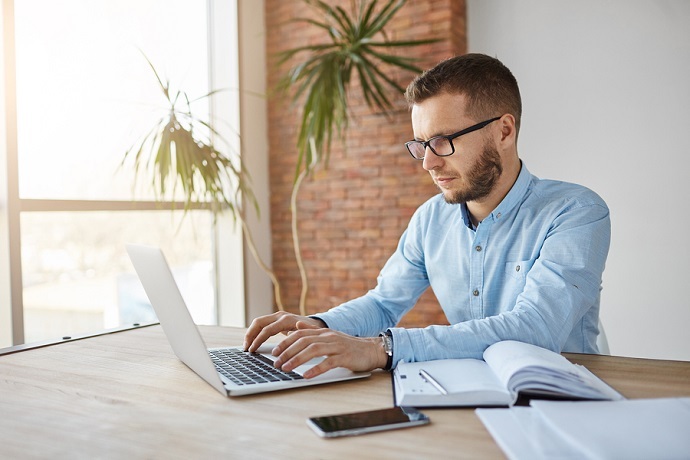 If your back is really playing up, it’s definitely worth considering a dedicated cushion to give you a little more lumbar support when you need it. You should consider this an investment rather than an expense since you really can’t put a price on your health. Beyond that, give the positions we mention above a try to take stress off your back rather than worsening an existing problem through poor posture or creating back pain that can end up causing you a great deal of frustration and sleepless nights. Come back soon as we’re now testing a range of mattresses to promote a better sleep and we’ve got plenty more lined up over the coming months!